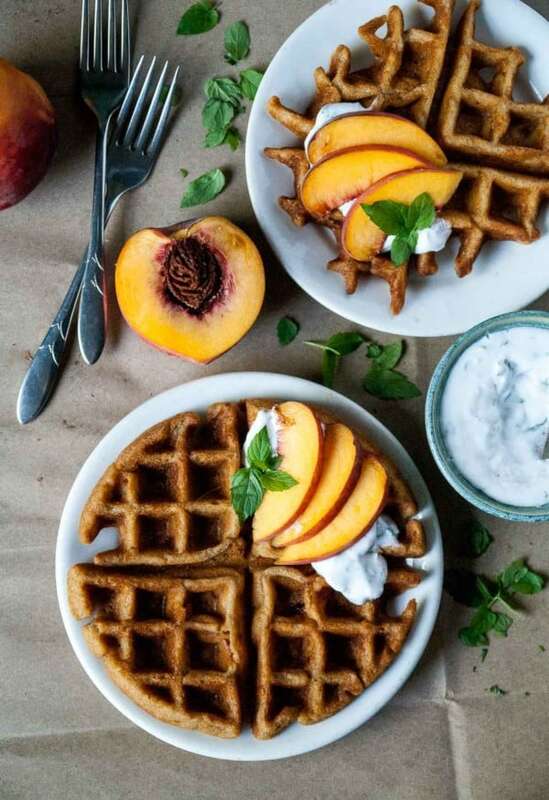 I never ever thought I would say this, but these vegan and gluten free peach waffles are BETTER than my original favorite waffle recipe. No joke, I was on struggle street with gluten free baking for a while. Outside of baking out of Ashley’s doughnut cookbook, I haven’t really touched on gluten free baking much. 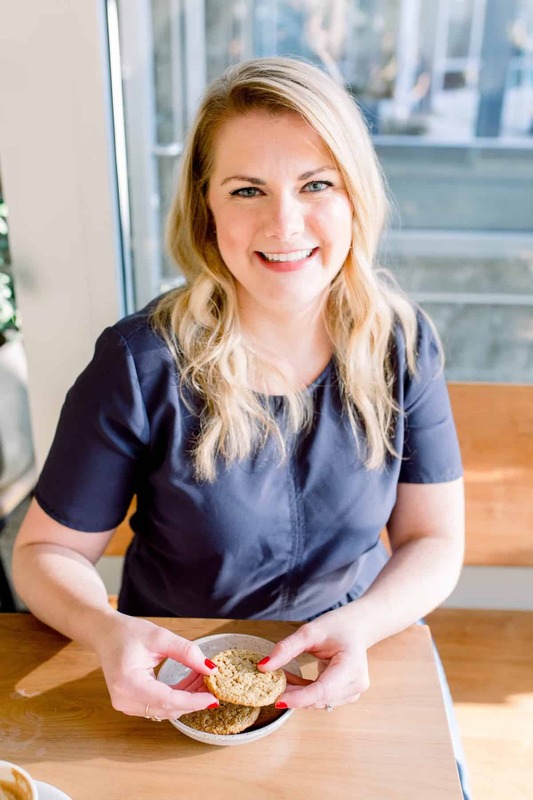 Partly because it scares me and partly because I don’t always want to have to buy ALL the flours to make a blend that I might only use a few times and mightily fail at a recipe while I’m at it. I had a Saturday afternoon of angry dough making/hair pulling out of my head/running to the store in a pinch while I was trying to nail a different gluten free peach galette recipe and was about to give up on the whole dang thing (hence why you don’t see it here!). 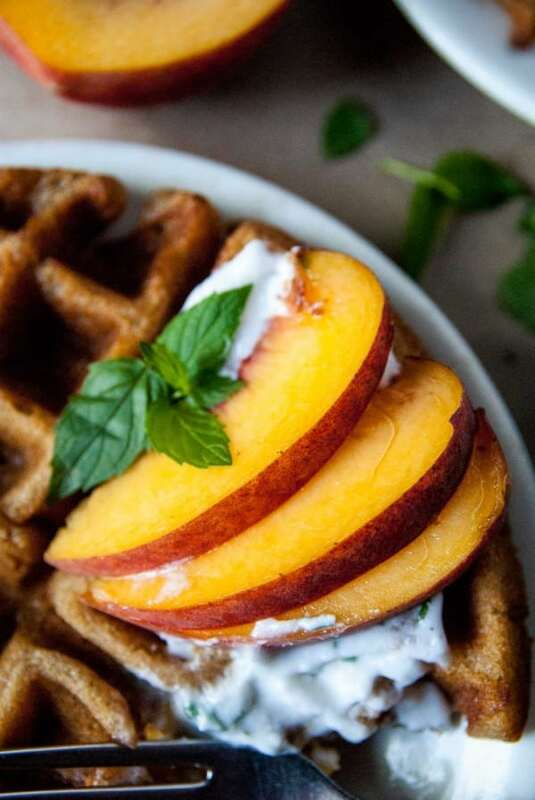 I knew had to be a way to make a delicious, crispy gluten free peach waffle, while still making the whole thing vegan and pretty easy to whip up. This gluten free blend is honestly the only one I’ve ever tried, so I can’t vouch for others, but I know this one is going to be my go-to favorite from here on out. Being able to modify a recipe by swapping the same exact amount of flour out for the blend was so much easier than I could have expected and made gluten free baking a little less scary/intimidating to me. Also, a word to the wise, make sure your peach is peeled before you fold it into the waffle batter. I’m usually all for taking lazy girl shortcuts, but when I didn’t peel mine the first time the skin somehow cooked up green in the waffles. Everything tasted fine, but my husband was not a fan of ‘those green things’ in the waffles and couldn’t get past how they looked. 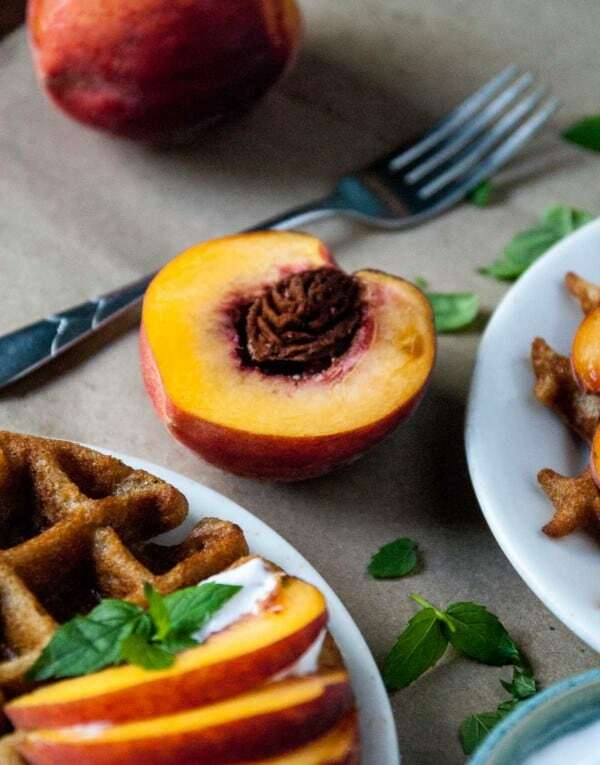 If you don’t mind that, take the chance and throw the peaches in your waffles with the skin on, but otherwise, take a few seconds and peel it! 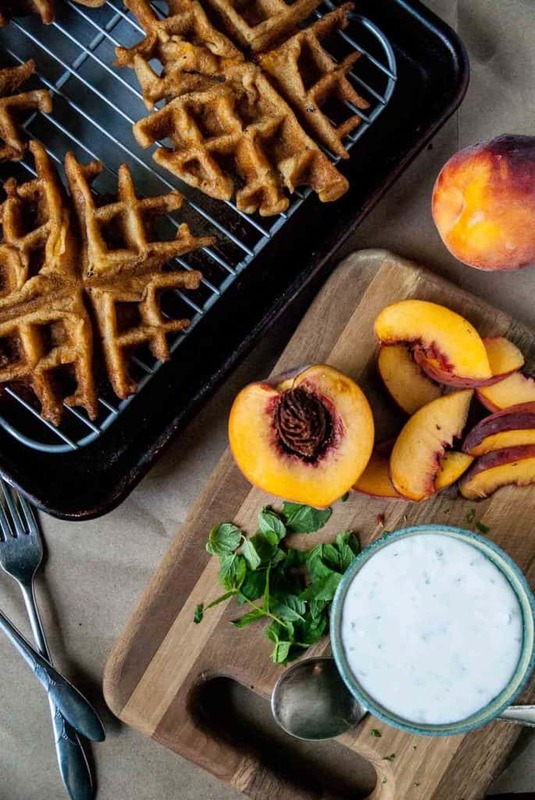 Basically the lesson from this gluten free peach waffle recipe is to peel your peaches and waffles are always the answer. 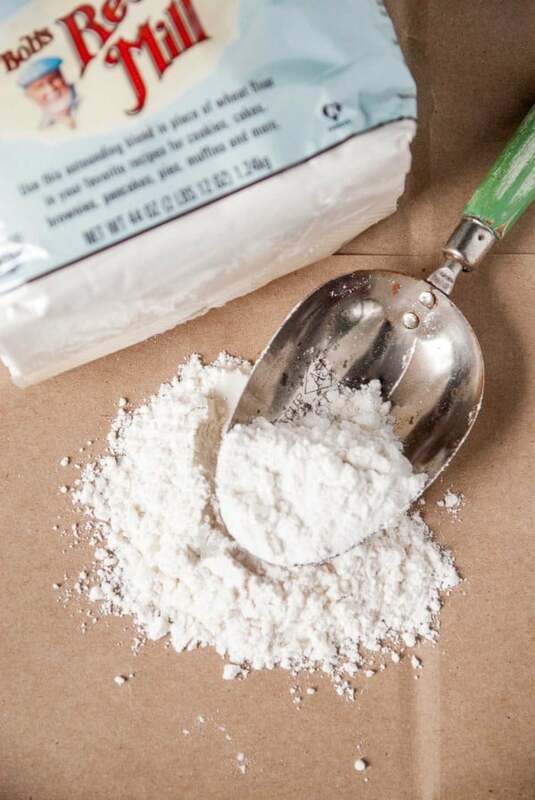 In a small bowl, whisk together the gluten free flour blend, baking powder, cornstarch, baking soda, and salt. Add in the milk, oil, vinegar, agave, sugar, and vanilla. Whisk until all ingredients are incorporated and no lumps remain. Fold in the chopped peach. Cook according to your waffle maker’s instructions, being sure to liberally grease the waffle maker each time you make a new waffle. Scoop by the 1/3 cup and cook for 5 minutes each. Remove and top with mint coconut whipped cream. To make the whipped cream: Whisk together the coconut cream, powdered sugar, and mint. Let chill until ready to serve with the waffles. Girl! These photos are killer. I love love love these waffles. And the mint coconut whipped cream is such an awesome and unique touch! 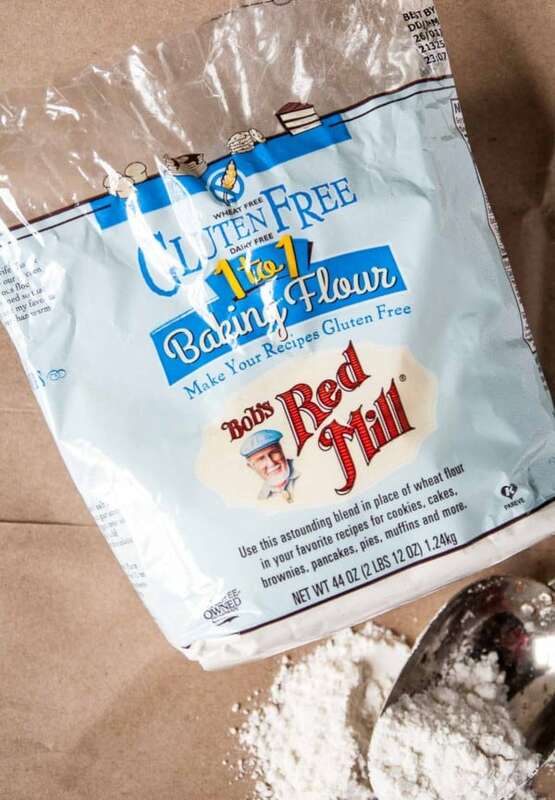 Bobs Red Mill makes GF baking so easy. Love them! Woohoo! These sound awesome! I love Bob’s Red Mill 1-to-1. Makes times when I don’t want to think about how to sub in gf flours the most simple solution. Beautiful photos, Abby! Yaaaaas! I’m giving you a long distance high ten right now. Waffles with BRM’s 1-to1 flour are a staple in my life, no joke. I made waffles for friends and family with that flour almost every week last winter, and now you’ve inspired me to start up again. That mint coconut whipped cream? UGH I want! These photos are absolutely stunning, girl!! They might be my favorite of yours of all time 😉 It’s making me seriously crave waffles… and I love that they’re gluten-free, too! Sending hugs!! I have had waffles on my mind for the past week. My good waffle maker of long ago is long gone. Someone gave me their maker and it is not great. I tried making waffles in it once. The first waffle came out whole. No prying or falling apart waffles which was great. The rest of the batter did not make me happy. Sounds like you were hoping for the same good luck after your first opening of this new recipe in your maker. So glad for you that you had luck. Do you think the waffle maker or batter makes the difference for success with whole waffles? I would love to know what kind of waffle maker you have. I want to purchase a new one. Glad to hear about your luck with the 1:1 BRM flour. Giiirrrrlll these waffles look like perfection!!! These waffles look so delicious! 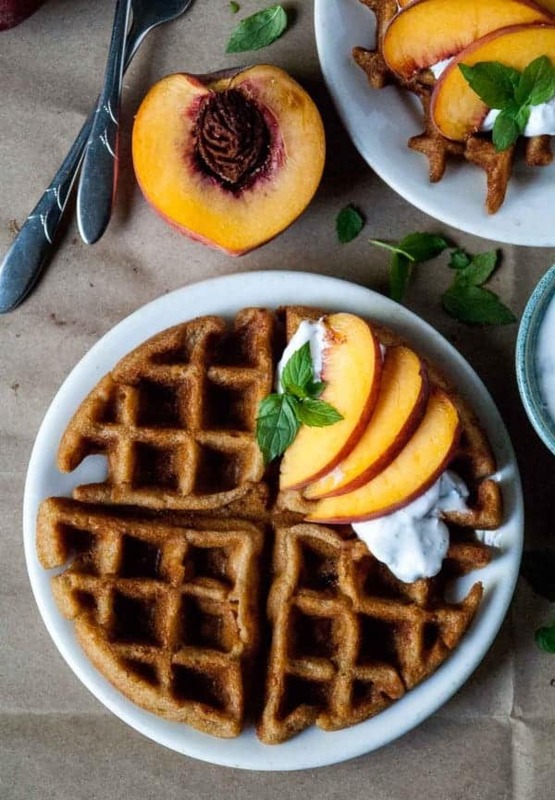 I’m glad you finally dipped your toes into gluten-free realm because: WAFFLES! 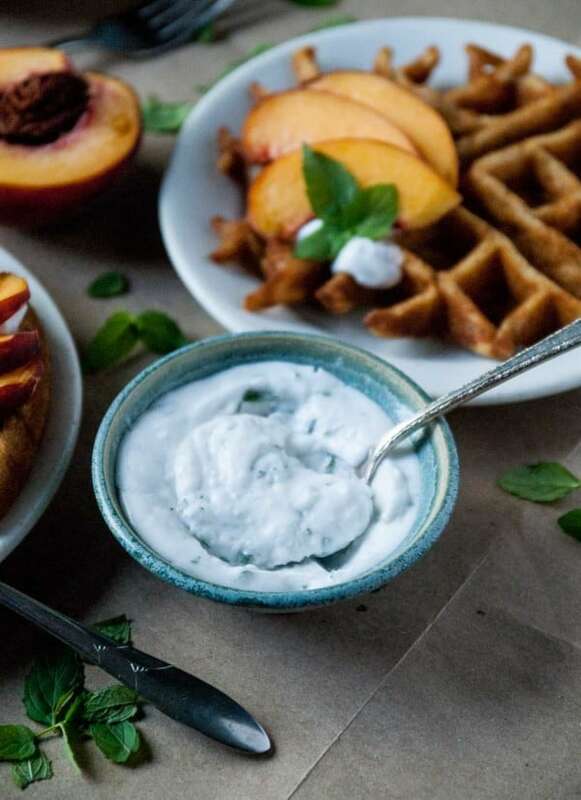 And that whipped cream paired with peaches is right up my alley! Oh my! I’m with ya on Bob’s. I’ve tried it and it works beautifully, especially for cookies! Love that whipped mint cream and your photog Abby! Well done my dear!